River Row is a spectacular place. 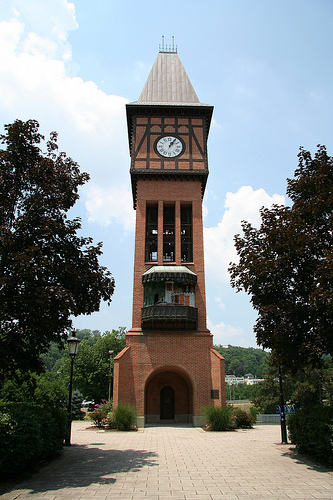 A celebration of German heritage and industrial architecture, it contains Main Strasse Village in Covington (see Carroll Bell Tower, above left), beautiful 1800s stone bridges (above right, connecting Covington with Cincinnati), and modern facilities like the famous Newport Aquarium (right), where schools from all over Kentucky, Indiana and Ohio bring students on field trips. The row of six towns begins with Ludlow to the West and extends eastward through Covington, Newport, Bellevue, Dayton and Silver Grove, even though all the good restaurants are in Covington, Newport and Bellevue. We list restaurants in order from West to East. If you're coming in from Maysville or prefer to drive from East to West, just go to the bottom of this page and scroll upward. The men of these towns for 100 years made a living from the river and the railroads. The river and railroads haul more freight today than ever, but they do it using far fewer men, so these towns had been in a long slow decline. They are now staging comebacks as residential and recreational complexes for the city of Cincinnati. There is no road called River Row. That's just the name referring to the row of towns. The actual road begins in Ludlow as Route 8 and Elm Street. It changes to 4th Steet in Covington, 3rd Street and David Cowens Drive in Newport, Fairfield Avenue in Bellevue, 6th Steet in Dayton, and Mary Ingles Highway through Silver Grove. But it's Route 8 throughout. Most of the restaurants either face directly onto this road, or are a block down from it floating on or built right up to the river. A few restaurants are a block up, such as the ones in Main Strasse Village in Covington. But these are all linear business districts, with residential neighborhoods beginning a block up and continuing to the tops of the hills. These towns were built between 1860 and 1900. Most redevelopment has taken place along the waterfront, except for Main Strasse Village and some upscale condo and apartment complexes. 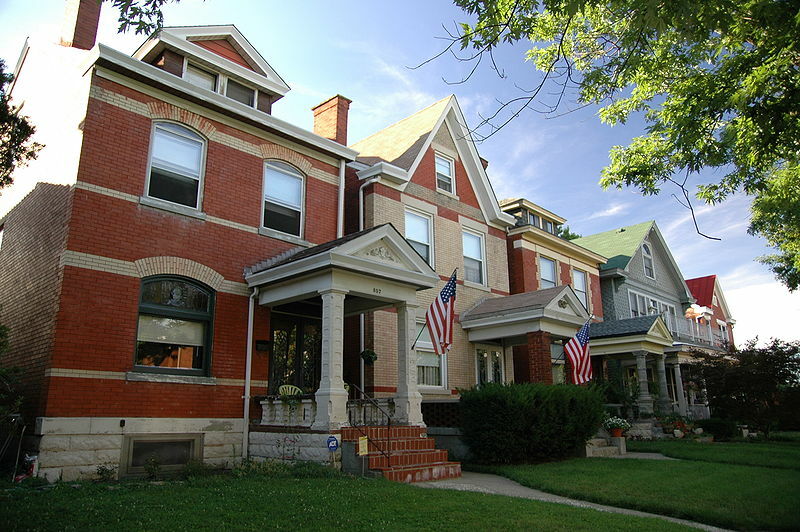 The classic residential neighborhoods close to the business districts are beautiful. 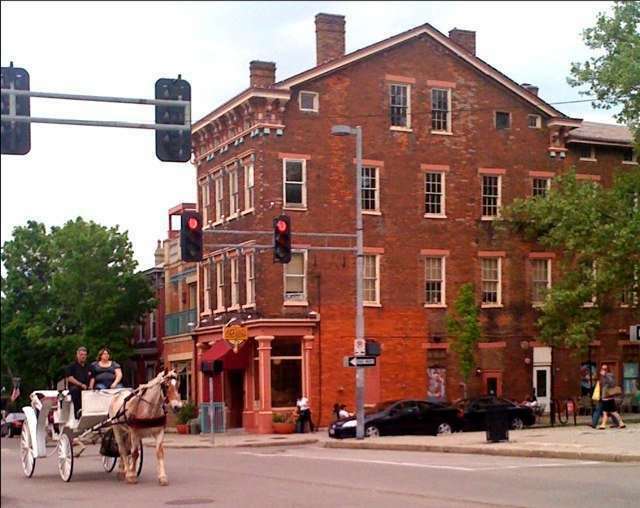 They contain some of the most architecturally impressive rows of homes in Kentucky or the city of Cincinnati. This scene (left) is in Newport. The development called Newport On The Levee is now the hottest night spot in Northern Kentucky or Cincinnati. 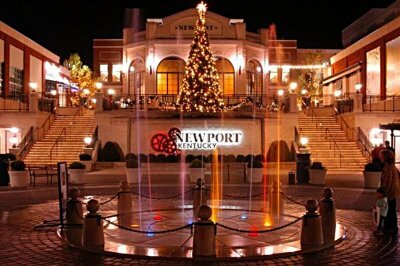 This photo is taken at Christmas, but Newport's waterfront is busy year round. There are restaurants, nightclubs, a theatre, the Aquarium, shops and other attractions. To be sure, some of the restaurants along River Row ate franchises of national chains. But there are several independent establishments with certified chefs and cutting edge menus. Before we focus on Newport, however, we'll start as promised over at Ludlow on the West side of I-75. What makes these river towns special is that they've managed to keep their own identities for 150 years without being swallowed up by the city, as has happened everywhere else in the nation. Ludlow is a beautiful and charming little town. Heading up Ludlow's restaurants is the Bromley Yacht Club. It really is kind of a yacht club. It's a Cincinnati tradition to cruise down the river and pull in here for dinner. especially after a Reds game or on any lazy Summer evening. But this is not an uppity yacht club. There's a huge shark glaring down at you as you walk in from the parking lot, and on weekends from 9 pm - 2 am a loud live band vibrates the window glass. Girls in bikinis sunbathe on the docks and there's a general air of decadence. This is a floating restaurant (and it bounces up and down pretty impressively when a tug pushing loaded barges passes) pretending to be a Cape Cod beach shack. Food is not gourmet but it's pretty good Summer evening fare. The Grouper, whether in a sandwich or on a plate, is definitely worth ordering, especially if you ask for it grilled. So is the Monday night Grill It Yourself Steak. The Sunday morning brunch is a winner. They do a good job with battered fish, particularly Beer Battered Cod. There's a Cuban Burger worth trying. Drinks come in styrofoam cups, except beer, which comes in cans. One small warning : Bromley's doesn't take credit cards. They want cash. They do have an ATM, but the bank charges you $3 per transaction. So bring cash. Many people consider Jeff Ruby's Waterfront the crown jewel of Covington's restaurant collection. It's pretty impressive, a five star steak and lobster house with sushi bar, grand piano surrounded by a horseshoe shaped marble bar, and huge picture windows looking out on the river and Cincinnati skyline. As you would expect with an upscale restaurant, the wait staff attends to detail. We know steak pretty well, having learned from the great steak houses of Texas and Wyoming. Based on this background, we think Ruby's serves very good steaks. It doesn't matter what kind you order and how you want it fixed, they do a good job with them. But we think their seafood never gets the credit it desderves. Their best entrees are b etter than their steaks. They do a fine job with their Soup of the Day. We can't find fault with much, but their salads always fail to impress us. They seem like exactly what you'd fix at home. For the price, we'd expect better. However, for a special occasion (anniversary, Valentine's Day, promotion or retirement), this would be a solid choice. Mike Fink's is a remodelled doublestack steamboat with a side deck added for more room. The boat itself is pretty impressive. 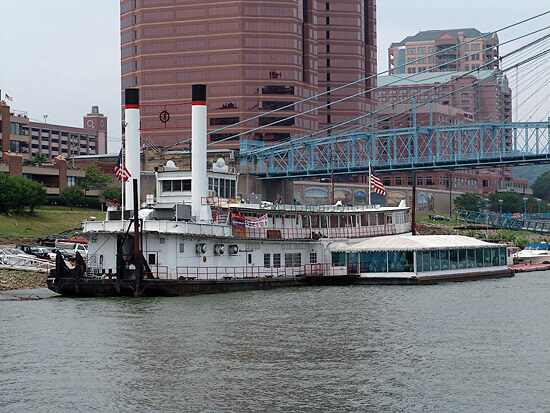 It was originally a paddlewheeler in Texas, then moved to the Upper Ohio. In 1968 it was converted to a restaurant and has operated at this site ever since. It is on the National Historic Register and, since it hasn't moved in 44 years, is considered an Ohio River landmark. You'll be greeted by fresh flowers, white linen tablecloths, paintings and photos of riverboats and river scenes. The views of Cincinnati across the river are also impressive. But it's the food you come for, and it matches the surroundings. Their signature items are the Alaskan King Crab and Cherrystone Clams, but the Salmon and Halibut are also good. We highly recommend the Stuffed Rainbow Trout if you're into freshwater fish and the Voodoo Chicken Jambalaya if you're not. As this is written, the restaurant is temporarily closed. 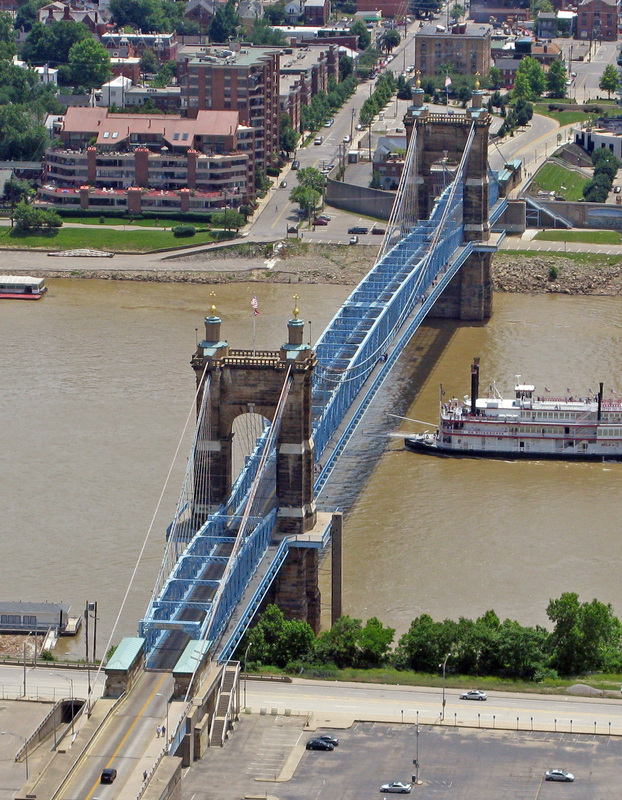 It has been taken to a drydock for renovations, mainly servicing of the hull, and is scheduled to return to Covington and reopen in September 2011 at its traditional location at the foot of the Roebling Suspension Bridge. 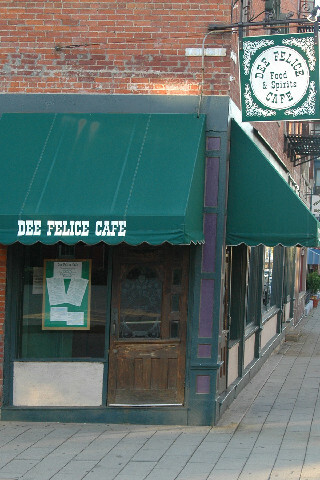 Dee Felice is Covington's New Orleans restaurant, featuring Cajun and Creole food with live jazz as often as they can provide it, including Sunday afternoons. There is some serious eating to be done here, beginning with our favorite appetizer, Ricardo's Ravioli (ricotta and jalapeno filled ravioli, deep fried, topped with crawfish jalapeno cream sauce). Of course, there are also Shrimp, Oysters three different ways, Calamari, Carpaccio and Escargot. Even if you're not a soup lover, someone at your table has to order a cup of the File Gumbo, a Cajun affair with vegetables, meats, seafood and rice. Whatever their Soup of the Day is, try a cup of it, too. The other must try item on the preliminary menu is their Hot Slaw (shredded cabbage, diced peppers, red onion, bacon bits in a hot vinegar dressing). They offer several enticing salads, but specify that you want the House Creole Dressing. The Sun Coast features greens, white raisens, walnuts, peppers, grilled chicken strips, grilled red onion and feta cheese in a raspberry vinaigrette. The Greek Spinach Salad offers spinach, red onions, peppers, mushrooms, green and black olives and feta cheese with Italian dressing. Once you get to the entrees, however, recommending becomes difficult. We think they do their best job with their Shrimp Creole and Crawfish Etouffe, but it's always tempting to order the Portabello Etouffe. As far as we know, this is the only restaurant in Kentucky offering it, and it's every bit as good at what you'll get in the French Quarter. Dee Felice serves six Blackened entrees : Halibut, Scallops, Chicken, Pork Chops, Filet and New York Strip. If you are a true Cajun lover, or just like your food hot, this is your page of the menu. Among their steaks are very good renditions of Beef Tournedos (tenderloin, pan seared, in red wine, topped with bernaise, on a bed of linguine), Beef Marsala (medallions lightly floured, buttered, in red wine), Filet Mignon and New York Strip. For pasta lovers, there are Shrimp Fettucine, Fettuccine Alfredo, Pasta Dante (blackened chicken strips over onions, peppers and linguine sauteed in white wine, topped with feta cheese), and Pasta Francesco (shrimp and artichoke hearts in white wine and lobster butter with linguine). Experienced New Orleans diners will notice that Dee Felice is a little heavy on tomato and light on roux, and the blackened items stop a little short of Cajun Heat for that true Nawlins taste, but this is still a Kentucky-Cincinnati treasure. 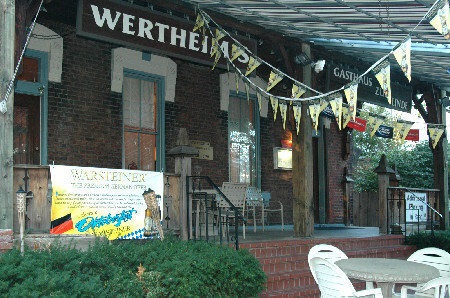 Wertheim's is Covington's classic German restaurant. Depending on which waitress you get, service can be inconsistent, and they have, unfortunately, tried to Americanize the menu. However, the German items are quite good. Of the appetizers, we suggest either the German Sampler (reuben rolls, kraut balls, sausages and kraut for two) or the Sauerkraut Balls. Among their four soups we recommend a mug of the Goulash, more Hungarian than German but quite good. Wurtheim's offers seven salads, none German. We like the Cobb or the Cottage Cheese Plate. If someone in your group is merely in the mood for a sandwich, Wertheims's serves the best Reuben in the Cincy area. Among the entrees, Jaeger Schnitzel or Wiener Schnitzel (differently fixed lean breaded pork) are the best, but Sauerkraut Balls, Deltsche Wurste (three sausages served with sauerkraut and potato pancake), Zigeuner Schnitzel (thinly sliced veal lightly breaded then topped with peppers, onions and mushrooms), Piccata di Vitello (breaded veal slices sauteed in lemon and wine then served on fettucini alfredo), and Rhindsrouladen (beef stuffed with bacon, pickles, and spices) are all worth trying. Apple Strudel is one of their best items. Wertheim's is a block above 4th street, in Main Strasse Village. The Behle Street Cafe is one of those classic downtown cafes with good food, mediocre service and late hours. The ambience is heavy with wood, chrome and large chandeliers. Its signature items are its Crab Cakes (creamy with bits of carrots, scallions and peppers), Taco Soup and desserts actually prepared by nearby bakery Bonbonerie, most notably Opera Cream Cake. Of the appetizers, the star is the Sweet Potato Fries With Dipping Sauce. Someone at your table has to order a cup of the Chicken Pot Pie Soup, a creation of original owner Joe Behle (who died a few years ago). They take great pride in making all their own salad dressings, so if several of you order salads you might want to order different dressings and sample around; the Blue Cheese will be the lightest and most delicately flavored you've ever tasted. Among entrees, we recommend the Shepherd's Pie, New York Strip, Cappelini Meatloaf and Cappelini Vegetarian. Behle Street does a great job with Scalloped Potatoes, Lumpy Mashed Potatoes & Gravy, and their Mexican Cucumber Salad (red and yellow peppers, jalapenos, cucumbers, onions and greens). In good weather, there's a patio. Chez Nora is more popular as a hot spot than a restaurant. 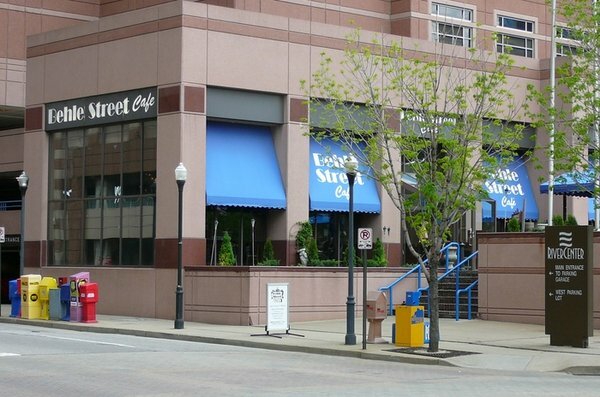 Its Rooftop Patio and Jazz Club offers live music five nights a week with one of the best views of Cincinnati, and the dining room walls are lined with movie star photos. But the food's good, too. Their signature item is their Crab Cakes & Special Roumelade Sauce, which can be ordered either as an appetizer or an entree. Crab Cakes seem to be a Covington favorite, and a point of competition among restaurants. The Chez Nora may not beat Behle's, but it's close, and certainly one of the best in the Cincinnati area. If you're into seafood, there is also the Au Gratin Crusted Red Snapper, which shows up often as a special. The fish they buy over at the Cincinnati Fish Market is fresh, they bake it just right, and the light breading works perfectly. If you order it, ask for the Remoulade Sauce on the side. It works just as well with the Snapper as it did for the Crab Cakes. There's also Korean Tuna, a pan seared tuna steak with a ginger soy sauce. Or try the Chicken Sausage Jambalaya. Probably their most creative entree is the Cherry Pork, a tenderloin topped with a cherry glaze and bourbon creme sauce. Chez Nora serves eight Salads, led by the Filet Tips Salad (chopped romaine lettuce, red onions, tomatoes, asparagus, bleu cheese, garlic - horseradish redskins and filet beef tips). Desserts are made by local bakery Bonbonerie, and feature a great Key Lime Pie and two kinds of Cheesecake. 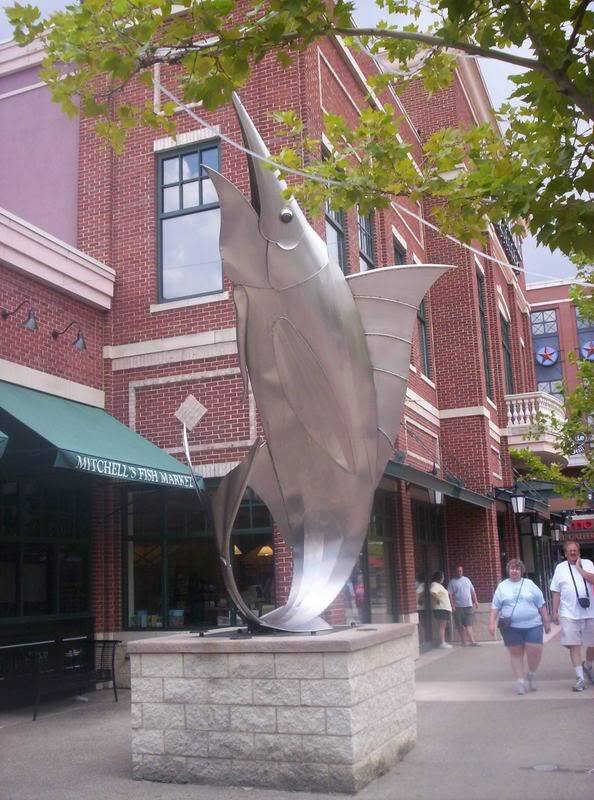 Mitchell's is the great seafood restaurant adjacent to the Newport Aquarium. They do a fine job with seafood by flying everything in fresh daily from Cape Cod, Chesapeake Bay and the Gulf. The menu changes daily, reflecting what's available. The Sourdough Bread they start you out with is very, very good, but you have to be careful and not fill up on it. Among the appetizers, if you're into dips, their Crab Spinach Artichoke Dip is outstanding. If they have the Seafood Gumbo or Lobster Bisque, order a cup for your appetizer. If the Georges Bank Scallops or Blue Crab are in, order one of them for your entree. They fix the scallops with spinach, mushrooms, potatoes and sea salt, and the crab with a simple alfredo sauce. If those are unavailable, try the Chilean Sea Bass or Yellowfin Tuna with stir fry vegetables. Or you might try one of their platters, which would be plenty for two. We especially like the Combo Platter, which includes cod, shrimp, scallops, fries, hush puppies and coleslaw. If you prefer freshwater fish, the Trout, either Pecan Crusted or Broiled, is great. Mitchell's offers a Shanghai Option for any of their fish entrees : a ginger soy sauce with sticky rice, scallions and spinach. If you eat a lot of seafood, this provides a different experience and it's good, but we still prefer the traditional flavors. We spend a lot of time on the coast and eat at a lot of seafood restaurants, and Mitchells is the best in the Cincinnati area. The wine list leans heavily toward whites. 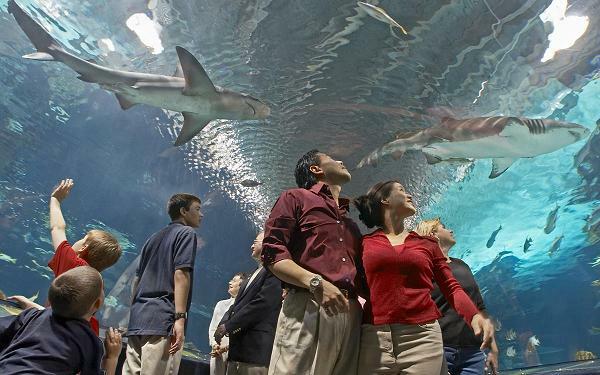 A lunch stop during an Aquarium visit might include a bowl of chowder or bisque, a salad, an an order of pan roasted wild blue mussels with white wine, garlic and tomatoes. For desserts, the Shark Fin Pie is a MUST, but realize it's enough ice cream, fudge, chocolate, caramel, nuts and peanut butter for three. If you're a huge oyster fan, Monday nights here are Oyster Nights for $1.00 apiece. On cold or rainy days, the decor inside features lots of glass and warm wood. 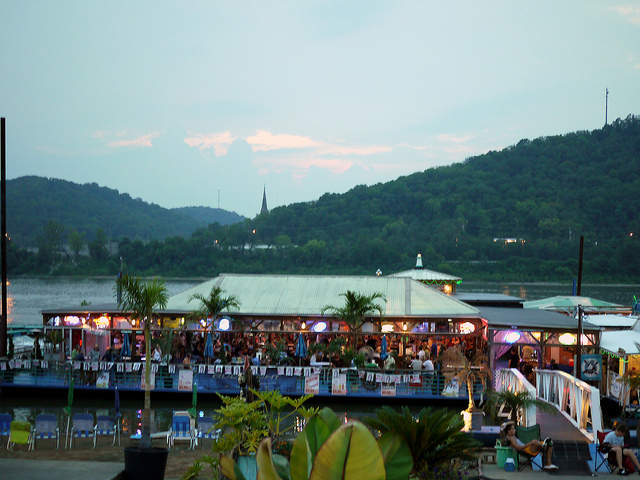 Weather willing, the outside patio offers great views of the Cincinnati skyline. 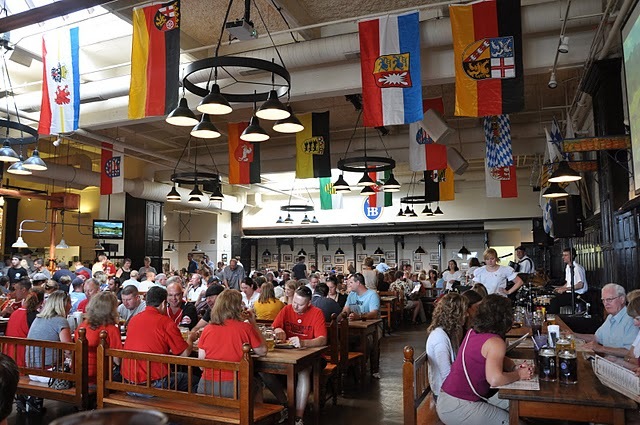 Haufbrauhaus is the American version of the German Haufbrauhaus in business since 1828. This 2003 Dayton location has done so well they've opened new ones in Pittsburgh and Vegas. If you're a beer conneisseur this is The Place, but the food's great, too. Among appetizers, the Soft Dough Pretzels, Fried Pickles, Potato Pancakes and Sauerkraut Balls are best. The Hungarian Goulash is a MUST. This is one of Cincinnati's greatest items, but order only the SMALL bowl (the large is a meal in itself). Entrees are a German Paradise : Mettwurst, Bierwurst, Saurbraten, Schnitzel, Bratwurst and Kasseler Rippchen. We especially recommend the Wurstlteller, a trio of three wursts with sauerkraut and potatoes. For a couple or three friends there is the Schmankerplatte, a Bavarian Sampler Plate of sauerkraut, schweinbraten, smoked pork chops, three wursts, fried cabbage and potatoes. There's Oktoberfest Schweinshaxe, a slow roasted pork shank with crackling, sauerkraut and bread dumplings. Classic sides start with red apple kraut, spatzle with cheese or haxen sauce, and German potato salad. Apfel Strudel is the Desert de Rigeur, but there's Black Forest Chocolate Cake or Windbeutel. Pompilio's is the finest Italian restaurant in Northern Kentucky and one of the finest in Cincinnati. It opened in 1933 and except for replacing the pressed tin ceiling is still serving in the same facility with the same mahogany bar that is one of the most impressive in three states. They've filmed movies here, most famously Rain Man. Those photos of Hollywood stars lining the walls were all taken right here; the one of Dustin Hoffman is particularly impressive. This is a classic prewar neighborhood family establishment; Newport families have eaten here every Friday night for generations. It's not big, so if you go on a weekend night between 7 - 9 expect to wait. But it's worth it. The bread is made every afternoon at a local bakery and sliced right here in a large 1930s slicer. Pompilio's signature items are their Eggplant Parmesan, Meat Sauce Lasagna, Ravioli, Marinara Sauce, and the Penne Woth Sausage and Peppers. Their Minestrone is unique in that they make it with black olives. The salads are certainly fresh and crisp but purists sometimes complain that they're served chilled. Long time customers have come to like it that way. Portions are large, so either come hungry or expect to take tomorrow's lunch home. Their wine selection is small but good. Among desserts, the Cannoli and Tiramisu are outstanding. Six blocks south of the Aquarium at the corner of 6th and Washington. Rio Grande is Dayton's classy Mexican restaurant. Don 't let the fact that it's in a strip mall deter you. This is the best TexMex establishment in Cincinnati or Northern Kentucky, and since it abolished smoking, it's full most of the time. This is not a chain (yes, there are other Northern Kentucky locations but it's still one local family) and the food is not Corporate Mexican. Beginning with the warm tortilla chips and salsa, this is about as authentic a Texican cuisine as you'll find this side of Houston, and the portions are very generous. The Chili Rellenos are outstanding but they serve them with the cheese melted and runny, which some TexMex conneisseuers object to. We like them that way. The Chicken Burrito Grande here, which overflows the platter, has its own local cult, and the Chimichanga, especially the Chicken version, is another popular item with the recurring customer base. If two of you are particularly hungry, try the extravaganza called the Especialidad de Rio Grande, a huge fajita plate with beef, chicken, shrimp, chorizo and skirt steak. Odds are, both of you will leave stuffed and still carry home tomorrow's lunch. Despite the huge portions, try to save room for dessert, so you can sample their Xangas, an obscene cheesecake concoction topped with caramel and ice cream. Service here is part of the ambience; they all seem related, speak limited English, and joke back and forth while tending their tables. 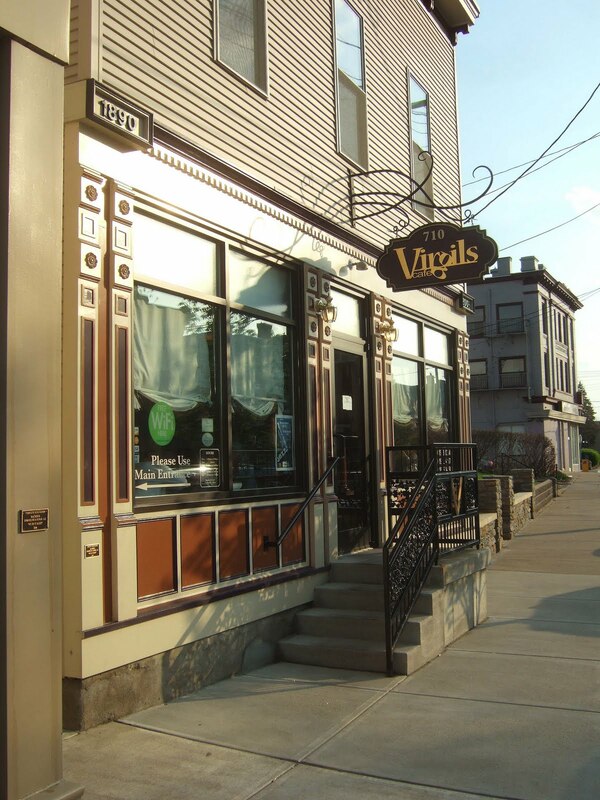 Virgil's Cafe is Bellevue's gourmet restaurant, a block up from the riverfront, named for owner Matt Buschie's father. Since the building was not originally a restaurant, but was remodeled into one, it is quite small and intimate. However, the food is outstanding. They make everything from scratch and the menu changes constantly. On one of our visits appetizers included Breaded Frog Legs and Pork Bellies and one of the entrees was Crawfish Stuffed Flounder. All three were delicious. Soups usually include The Bison Chili, which is quite spicy, and Matt's Tomato Bisque, a particularly rich version. The bread is excellent and be sure to taste the Jalapeno Cheddar Hush Puppies. Virgil's seems to offer the Etouffe and Shrimp Creole frequently, and both have become favorites among regular customers. Their Etouffe has plenty of chicken breast and Matt's own sausage in a rich dark roux based gravy. The Scallops & Risotto are one of the best scallop dishes in Cincy, and the Beef Tornadoes With Bacon Wrapped Asparagus are unusual but very good. For traditionalists there are Blackstrap Meatloaf, Mac n Cheese, and Kentucky Hot Brown. Prawn Creole Over Cheese Grits and the Crab Cakes are outstanding. Don't forget to order a side of the Shoestring Sweet Potato Fries. The Food Network TV show Diners, Drive Ins and Dives featured Virgil's Homemade Andouille Sausage, and it is pretty memorable. Chef Matt creates a special dish he calls Seafood Boil. If he's fixing it the night you're there, and if you're the least bit of a seafood lover, order it. There's a Sunday Brunch which has developed quite a following. It includes everything from French Toast to Grits to Poached Eggs. Matt brings Molly Wellman in several nights a week to serve as his Batender / Mixologist. She's one of Cincy's best. But the wine list, although small, is also very good. IF you can save room for dessert, try either the Bourbon Flourless Cake (which is extremely sweet) or the Banana Cream Pie. Call ahead for reservations. 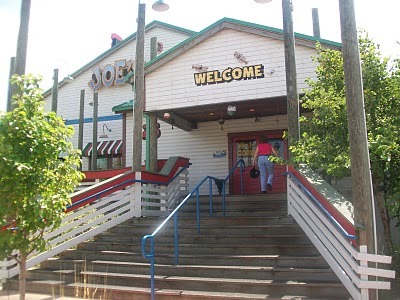 Joe's Crab Shack is a Bellevue riverfront tradition. It features a party atmosphere, with the wait staff snake dancing between tables singing Happy Birthday, every seashore icon imaginable hanging from the ceiling or tacked to the walls, and a gift nook selling t shirts, mugs and souvenirs. Among their appetizers, we recommend either a cup of the Clam Chowder or a bowl of the Crab Dip, although the Crab Nachos are a huge favorite among regulars. Joe's offers four salads, of which we prefer the Classic Cobb. They do a pretty good job with their Snapper Stuffed With Crabmeat, Blackened Tilapia, Grilled Salmon, Maui Mahi and Snapper Pontchartrain (smothered in mushroom sauce, topped with grilled shrimp). We think their Crab Cakes (made from scratch with lump crabmeat) and Paella (claims, shrimp, mussels, scallops, sausage, simmered in tomato basil sauce with rice) are their two best dishes now that they no longer serve their famous Crawfish Etouffe. However, Joe's specializes in Crabs and has a dozen different kinds of them (Snow, King, Dungeness, etc.) fixed a dozen different ways (Steamed, Grilled, Boiled, Boston, Orleans, Chesapeake, etc.). The classic Joe's entree is a bucket of crabs shared by 2-6 people. You can order Corn On The Cob, Crab Cake Sandwich or Popcorn Shrimp. Save room for Key Lime Pie or Sea Turtle Sundae, both very rich and filling desserts. 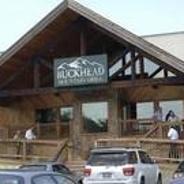 Buckhead Mountain Grill is one of four locations in a small Louisville chain. Bellevue, however, is by far its most impressive location, fronting on the river. In poor weather, big picture windows allow diners inside to enjoy views of the river and Cincinnati. In good weather, the 150 seat patio which extends far out over the water, allows even better views. The inside is themed like a big Western ranch house or national park lodge. It's a beautiful place to enjoy lunch or dinner. It would be hard for the food to live up to the scenery, especially since it's mostly frozen, but the menu is extensive and service efficient. There's a lot of Corporate Food, most of it fried, on this menu, but you can pick and choose around it and put together a good meal. Among appetizers, we recommend the Fried Green Tomatoes and Loaded Potato Soup (topped with cheese and bacon bits). There's a page of burgers, sandwiches and wraps, but we think their best lunch items are the Wyoming Pot Pie (chicken, veggies, flaky crust), Kentucky Hot Brown (roast turkey, tomato, parmesan cheese, bacon strips, mornay sauce) and Made From Scratch Meat Loaf . For dinner Buckhead offers eight Steaks, five Chicken entrees, Grilled Salmon, and Manhattan Roast Beef (bread and mashed potatoes topped with roast beef and brown gravy), but we think the best is their Tequila Lime Whitefish (it's marinated in the tequila lime sauce, topped with pico de gallo, served on cashew wild rice). Sides include Baked Apple, Bleu Cheese Cole Slaw, Baked Sweet Potato and Wild Rice. The Hot Apple Pie is their best dessert.